In my seemingly never-ending quest to explore and discern the unique nature of each of Redwood City’s seventeen defined neighborhoods, I’ve now come to Bair Island. Bair Island is an interesting place: it is entirely on the east side of Highway 101, and runs from Whipple Avenue at the north end to Woodside Road at the south end. The neighborhood is cut in two by Redwood Creek; the northern portion is where you’ll find most of the residences whereas the majority of the southern portion is undeveloped land that is proposed for various uses. In these posts I try to discern the neighborhood’s essential character, and the Bair Island neighborhood is one of the easiest to define. Most of what you find here is multi-family residences—apartments and condominiums—and nearly all of them are oriented towards the water. Redwood Creek, Steinberger Creek, Smith Slough, and various marinas define the Bair Island neighborhood, as does Bair Island itself—even though the neighborhood doesn’t actually include it (which is actually three islands; the one most people know as “Bair Island” is really the westernmost of the three, Inner Bair Island). As you can see, when heading out Seaport Boulevard (west of the freeway this is Woodside Road) the neighborhood stops short of the business parks accessible from Chesapeake Drive, and thus doesn’t include the Redwood City Municipal Marina, the Sims Metal recycling operating on Seaport Boulevard, the cement plant, Westpoint Marina, or the Pacific Shores development at the end of Seaport. What it does have is a number of high-end condominiums and apartments, plus a hotel and, for the moment anyway, a number of floating homes at Docktown Marina. The Bair Island neighborhood is also where you’ll find Redwood City’s Police Station, the Maple Street Correctional Center (a county facility), and a number of Redwood City’s automobile dealerships. There is also a lot of land that is in various stages of development. What you won’t find are any real stores or restaurants: for those, you’ll need to head west of the freeway. It does include the half-dozen or so properties that make up the proposed Harbor View development. These properties comprise most of the land you can see between Blomquist Street and Highway 101, just north of Seaport, that used to be home to Lyngso and the Malibu golf and go-kart complex. Jay Paul Company has proposed a huge (almost 1.2 million square foot) office development for the site, but is having a difficult time gaining city approval. If approved and built, this project would radically change the neighborhood’s character, adding a great deal of office space to a place that has almost none. This new development would sit across Blomquist from the neighborhood’s one heavy industry: this is where Graniterock has one of its road materials manufacturing and recycling facilities (I believe that they mostly crush rock and old concrete here). The Harbor View development is just one major project that is proposed for the Bair Island neighborhood. Follow Maple Street around where it makes a large “U” and you’ll find yourself next to Docktown Marina. 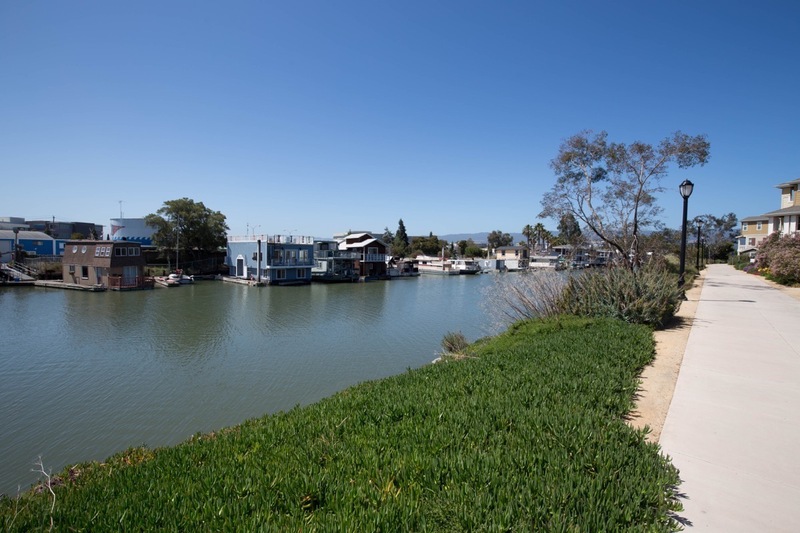 There apparently has been a marina of sorts in this area since around 1960, but for various legal reasons the city is closing the small floating home community that is there today and either buying out or helping relocate the various residents. Lawsuits are flying and the ultimate fate of the various homes are uncertain, but a great many of the residents have already been moved out: of the homes that are there today, some 25 are apparently scheduled for demolition. 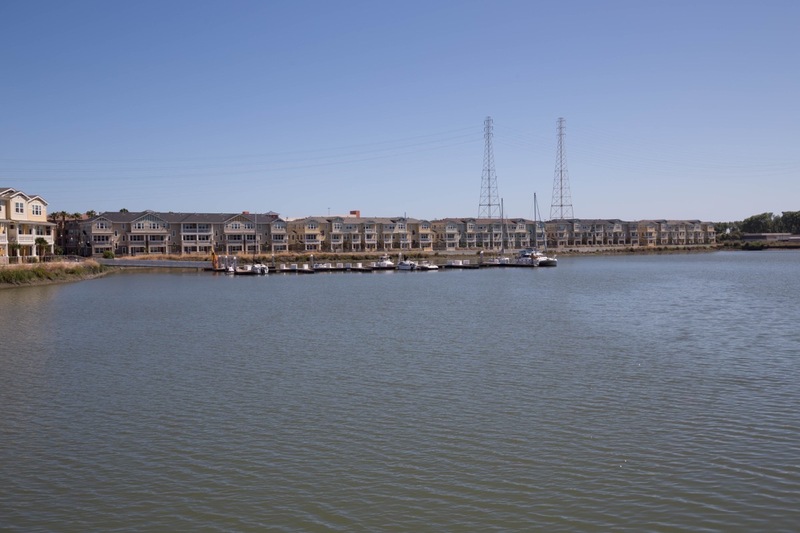 Whatever happens to the floating community itself, the land immediately adjacent to Redwood Creek, where the floating homes are located, is where some 131 townhomes are scheduled to be built. This so-called Strada project will radically transform a small number of parcels that today contain a couple of old buildings, plus the Docktown parking lot and some empty lots that are being used for the storage of cars by a couple of Redwood City automobile dealerships. It will not only result in a new condo community, but will also add a new (small) public park and a healthy extension to the San Francisco Bay Trail along the edge of the creek. Just across Maple from where this condo complex is to be built, the city hopes to one day build a park of some sort on a large parcel that it owns, which would give the general public more reason to spend time in this neighborhood, and would give the Bair Island neighborhood something it doesn’t currently have: a good-sized park. The Strada project will also extend Maple Street to Redwood Creek right near Highway 101, where another much hoped-for city project would replace the current “bridge to nowhere”—which enables pedestrians and cyclists, but not cars, to move between the part of the neighborhood south of Redwood Creek and the much more populated part north of the creek—with a bridge that would also support cars. This new bridge would go a long way towards eliminating the bottlenecks that neighborhood residents must currently endure: the only way a car can get in and out of the northern part of the neighborhood—where the vast majority of the neighborhood’s residences are—is by negotiating the Highway 101 interchange at Whipple Avenue. The new “Blomquist Extension bridge” would provide them with a second entrance and exit: they would be able to cross the creek and then use either Maple Street or Seaport Boulevard. Before I leave the vicinity of the Strada project, I must mention the Bair Island Aquatic Center (also known as BIAC). BIAC provides “a variety of human-powered watercraft for member use.” I’ve never been inside, but they seem to have a great many kayaks in a wide variety of sizes, and I regularly observe large groups launching out onto Redwood City’s creeks and sloughs. Shifting focus to the northern part of the neighborhood, from the freeway you can see a handful of the neighborhood’s main businesses: the various Boardwalk Auto dealerships, Toyota 101, and Redwood City’s newest hotel, the 177-room Courtyard by Marriott that sits between the freeway and the One Marina condominium complex. But follow the main road through the neighborhood and, after you pass the hotel, the nature of the area starts to change: starting with the One Marina condominium complex, you quickly find yourself surrounded by residential properties. 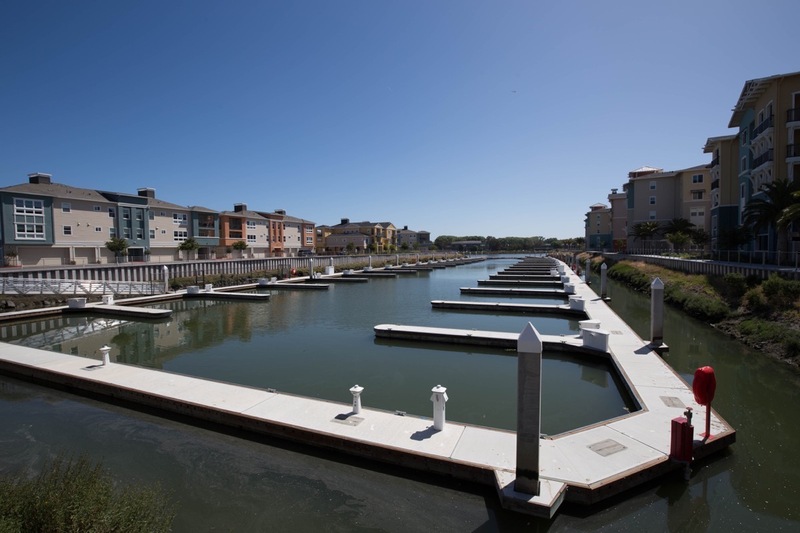 The One Marina complex consists of 231 townhouse-style condominiums arrayed along Redwood Creek and around the Peninsula Marina. The marina is quite large in terms of area, but has a surprisingly small number of slips: I counted about 28 when I was there, most of which were empty. There is also a small park at the eastern tip of the property, along the creek and directly across from Docktown Marina. Just beyond One Marina, on the same side of the road, is the Villas at Bair Island. This apartment complex has some 155 apartments, also arranged around a marina. This marina, which has roughly 100 slips, is packed with boats. The marina appears to be open to the public, but I’m guessing that it is entirely full at the moment. Continuing, you come to Blu Harbor, the giant apartment complex (with some 411 apartments) that was recently completed on the property formerly known as Pete’s Harbor. The several buildings that make up this complex are also arranged around a public marina, but although most of the apartment appeared to have been leased, the slips are as-yet empty. The marina at Blu Harbor also has a public launch ramp for hand-launched craft such as kayaks. I couldn’t tell if anyone has used it yet. In addition, Blu Harbor is partly surrounded by a section of San Francisco Bay Trail, open to the public, that provides excellent views of Bair Island. There are benches along the trail where you can sit and watch birds or kayakers. And there is a small park with some really nice children’s play equipment. Across the street from Villas at Bair Island, and thus not on the water (and not arranged around a marina) is a slightly older, slightly smaller (46 unit) townhouse complex called Marina Pointe. Between the Boardwalk Auto dealerships and Marina Point is a mini-storage place and a small collection of garage-based businesses: there is a small four-story office building here as well, but most of the businesses in the Bayport Marina Plaza seem to consist of a small office and a large garage-type space with a metal roll-up door. There were few signs so it was hard to get a precise handle on the type of businesses that were operating out of these spaces, but some appeared to provide services for boat owners, and others seemed to be automotive-related. The one remaining element of the Bair Island neighborhood is the long-unused Century Park 12 Theatres property. These theaters have been closed since 2008; for a time the property sat unused and empty, but for the last several years the large parking lot has been used by neighboring automobile dealerships to store their cars. It will likely continue to be used this way until SyRes Properties comes up with a development proposal for the land that is acceptable to the city. They have proposed various developments over the years; their current proposal is for a combination of residential and recreation. What they hope to build is a 336-unit apartment complex and a 100,000 square foot sports club, but the project proposal appears to be meeting resistance from the city. The Bair Island neighborhood is a fascinating place, one in which I enjoy spending time. I love walking along the water and seeing the wildlife on and around Bair Island. I also enjoy monitoring the progress of the neighborhood’s various development projects. It can be a somewhat challenging neighborhood to get to, especially on foot. But I find the journey worth the effort: Inner Bair Island itself is a beautiful place, and the new segment of the Bay Trail through Blu Harbor is a terrific place to stroll on a sunny afternoon. Except for the occasional airplane lining up to land at the San Carlos airport, most of the Bair Island neighborhood is a quiet place. 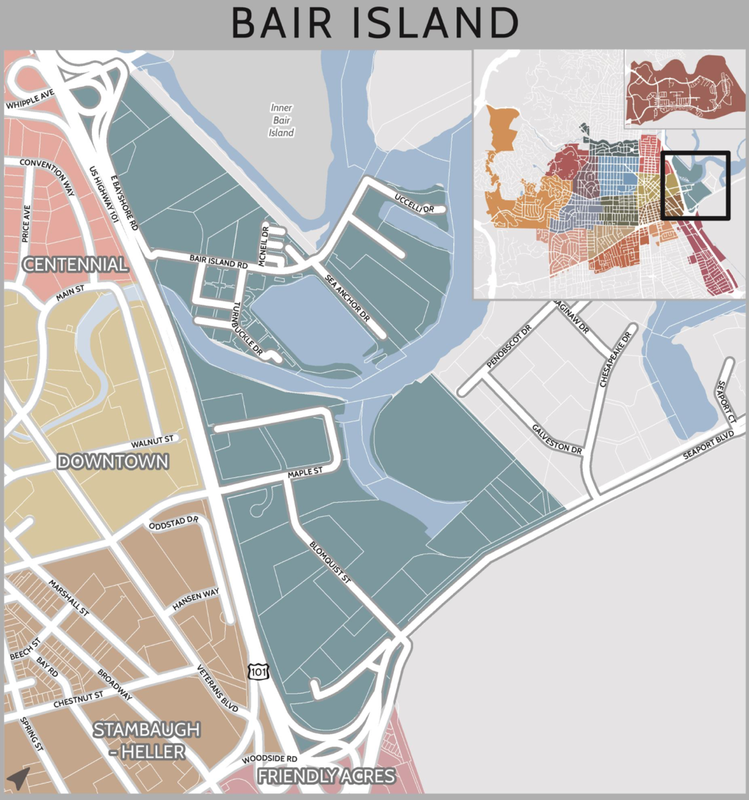 If the city could just improve the vehicular access to the neighborhood, and if only a small market and a couple of restaurants would open up out there, the Bair Island neighborhood would be nigh-on a perfect place to live. Not me. I don’t use walking poles. I usually have a full-brimmed Tilley hat and a camera bag on my back. If you see me, do say hi! 1. This week’s blog is a good tie-in with last week’s. With the flux in car dealerships in RWC, and their valuable sale taxes, there should be a coordinated plan to take care of the dealerships before more development is approved. The old theatre site, owned by SyRes Properties, should become part of the large adjoining Automall. Apartments should not be sandwiched between car dealerships. Make this property contiguous with the adjacent dealerships. 2. Why not put the 100,000 sq ft sport club in a more visible location, such as the former Crunch fitness club? 3. 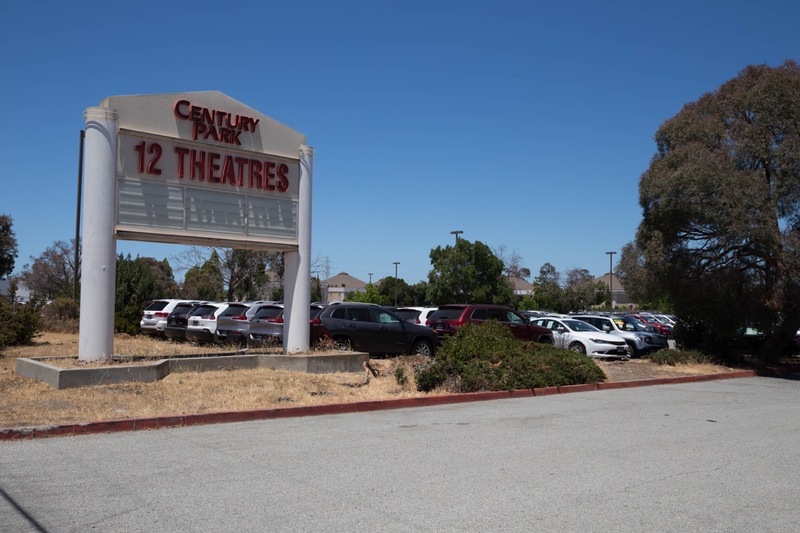 When are they going to take down the Century Park 12 Theatres sign? 4. Where would Towne Ford and Hopkins Acura go if the Beech St development gets approved? Since dealerships need/want visibility, why not go to the Harbor View development site? Then all the dealerships will be visible from 101. 5. When I opened the link to the Blomquist Extension bridge project, the construction start date read January 2001. What? Has this project been proposed and going nowhere for so long? With all the new residences going up, this project is sorely needed. It would have been a good time to build this new road when the Courtyard by Marriott hotel went up.